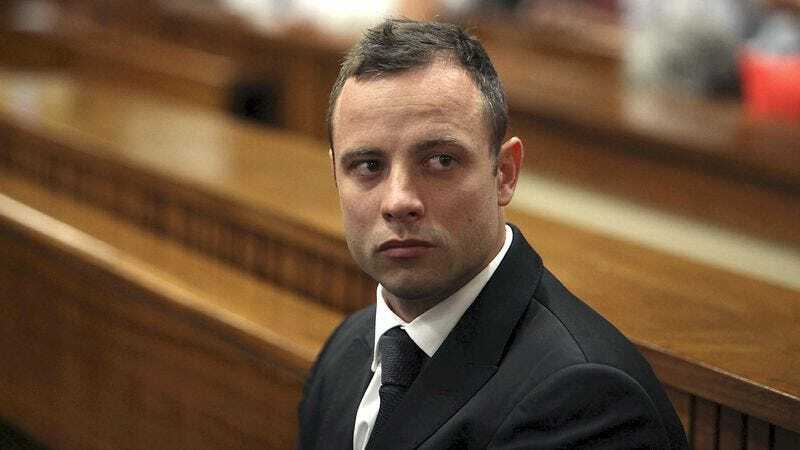 PRETORIA, SOUTH AFRICA—Insisting that the dangerous individual could be literally anywhere right now, a paranoid, wild-eyed Oscar Pistorius was reportedly overheard muttering to his defense lawyers numerous times during his murder trial Thursday that the burglar who invaded his home on the night of his girlfriend’s death is still out there and determined to come after him. “The burglar is always watching and waiting, and he won’t stop until he gets me,” a visibly tense Pistorius reportedly whispered from behind the defendant’s table, his eyes darting all around as he scanned the courtroom for the unnamed intruder who has not been seen since allegedly breaking into Pistorius’ home the night the paraplegic track and field star shot and killed Reeva Steenkamp. “I’m telling you, he could be here right now, and all he wants to do is steal from me. I’ll never be safe, never. Not unless…not unless I get to him first.” At press time, Pistorius was frantically reaching for the bailiff’s pistol after having spotted dozens of burglars sitting in the courtroom gallery.